There are some days when you just need a series of comforting things. Today is one such day for me. I woke up this morning in a strangely convoluted position (well, you try sharing your bed with two cats), arranged myself properly, and then went back to sleep huddled up in my quilt while listening to the sound of the wind and rain outside. The cats both protested at my daring to move by changing positions themselves; luckily this time we were all comfortable and I felt cosy and safe and warm and quite content. Then I woke up a couple of hours later at a more acceptable time but with a teeny tiny tickle in my throat. It hasn’t gone away yet and I feel like I might be going down with something. I had a pot of tea with buttery toast and Himalayan honey and then treated myself to a hot bath; today is one of those rare days when I don’t have any orders lined up. I have nothing to deliver today and nothing to plan for so I can cook tomorrow. In fact, I’m free until Friday, and it’s a blessed relief. Then Kace arrived, and he’s not really feeling on top of the world either. I decided some hot chocolate was in order; I recently bought five kilo slabs of dark, milk, honey, and white chocolate; I have a LOT of chocolate in the house. So I decided to make us two cups of hot chocolate using finely grated dark chocolate but with added white as well, for a bit of extra comfort. It was _awesome_. I served it in two tall mugs with cinnamon sticks as stirrers. As we drank our chocolate it started tasting lovely and cinnamon-y, and we were both sorry when we’d finished. The next time you’re in need of comforting, I suggest you make this. You will adore it – and if you make it for someone, they will adore you. There is no goodwill as amazing as chocolate-induced goodwill, let me tell you. 1) Set a double-bottomed saucepan on the stove over low heat and combine the milk and the dark chocolate together. Stir from time to time as the dark chocolate melts slowly into the milk. Take care that the milk doesn’t boil over. 2) Melt the white chocolate in a saucepan over hot water (or in a microwave if you use one). Set aside in the fridge until it thickens slightly; I put mine in the freezer to speed up the process. 3) Whisk the dark chocolate and milk mixture as soon as the dark chocolate melts with a hand whisk and pour it into two mugs. Spoon (I piped it quickly using a piping bag) the white chocolate mixture onto the hot chocolate. 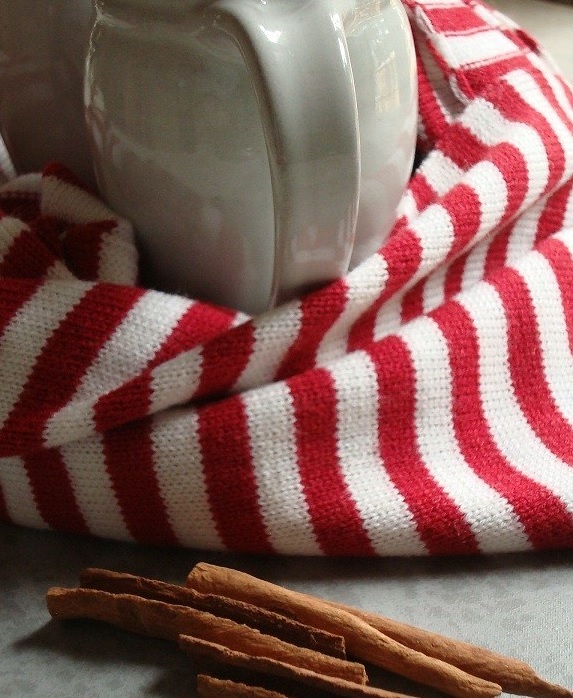 4) Put a cinnamon stick in the cup – one for each cup – and serve. Not lately, but I’ll take it! 😀 I love you too – which is why I’ll definitely be baking for you!